MorphVOXTM Pro takes voice changing to a new level. With high-quality voice morphing and ultra-quiet background suppression, this voice changer will transform your voice in online games and instant messaging.MorphVOX Pro can also morph an existing audio file or record a voice directly to file. MorphVOX Pro's simple and intuitive interface makes it easy for users to create voice-overs. Studios that use this tool can save time. MorphVOX Pro enhance your online gaming experience or to disguise your age. The new product has a completely redesigned user interface with user-accessibility in mind. 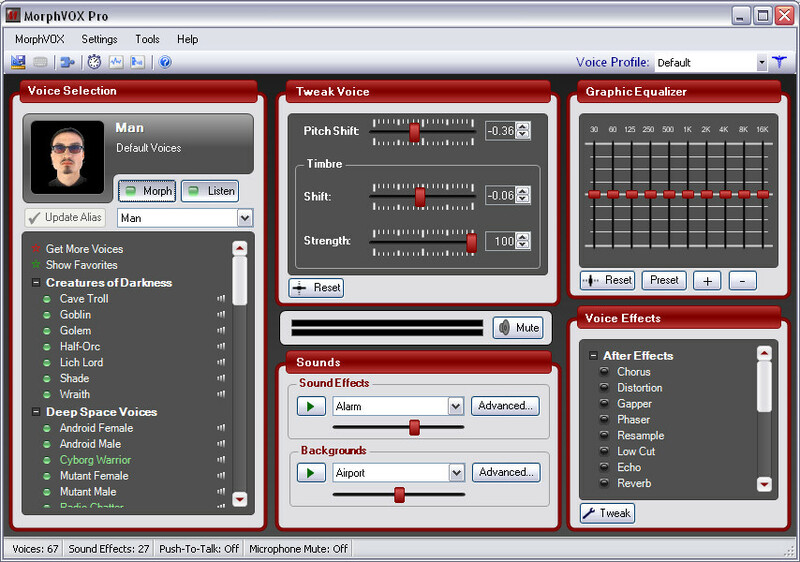 The all-in-one graphics interface simplifies the workflow for voice manipulation. The 'Studio Mode' setting puts all the major voice controls in a single resizable window, boosting user productivity. MorphVOX Pro superb voice changing algorithms and ultra-quiet background cancellation make it one of the cleanest-sounding voice changers available on the market. Its high-quality sound is perfect for creating voice-overs for your latest video or audio project. And MorphVOX Pro is optimized for online games. Change your voice to role-play and add fun to online games. MorphVOX Pro can be used with World of Warcraft, Second Life, EVE Online, Counter-Strike, Everquest, Dungeons and Dragons Online, GuildWars and much more. Qweas is providing links to MorphVOX Pro 4.5 as a courtesy, and makes no representations regarding MorphVOX Pro or any other applications or any information related thereto. Any questions, complaints or claims regarding this application MorphVOX Pro 4.5 must be directed to the appropriate software vendor. You may click the publisher link of MorphVOX Pro on the top of this page to get more details about the vendor.